Although not meant for speed we find out which one of these big, brawny SUV is the quickest in the challenging real world conditions. Despite packing the smallest engine, the Alturas is the quickest in most aspects. With a higher capacity and extra cylinder, the Endeavour is the closest to the Mahindra. The Ford’s brakes were the best performing ones under real-world conditions. Alturas G6 is the most frugal SUV here while the Endeavour is thirstiest. Before we find out the best performing SUV here, let’s get one thing straight. None of these big seven-seater, ladder-on-frame SUVs are meant to attack corners or clock fast times on a race track. Instead, they are built to haul passengers comfortably across the most challenging terrain on earth. But often, these SUVs are required to be quick on their feet, especially while cruising on vast and long highways with a full house. We put them through our series of performance tests to see which one comes on top. Here’s how it went. Before we go ahead, take a quick look at the engine specifications of these SUVs. As far as engine sizes go, the Ford Endeavour packs the biggest one while the Alturas G4 gets the smallest unit of the lot. Armed with the biggest engine and an extra cylinder, the Endeavour boasts of the highest power and torque figures here. The Alturas G4 has a power and torque output similar to the Toyota Fortuner despite a 0.6-litre deficit in engine capacity. The Fortuner and mu-X have identical power outputs but the Toyota edges past the Isuzu with a torquier engine. 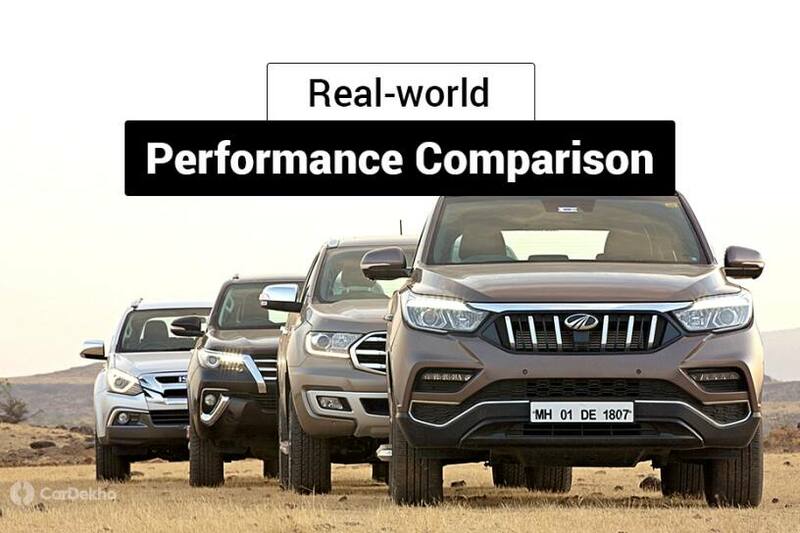 Now that we are through with the on paper comparisons, let’s take a look at their real world performance. Despite its small engine, the Alturas G4 surprised by being quickest of the lot by a sizeable margin. Be it the 0-100kmph dash or the quarter mile run, the Alturas G4 comes on top. However, in kickdown acceleration tests, the Endeavour is faster by a mere 0.11 seconds. The Fortuner and mu-X are closely matched and take more than 12 seconds to reach 100kmph from a standstill. Even the quarter-mile figures are quite close. However, the Fortuner is a tad slower for quick overtaking manoeuvres. Now that we know how quick all these cars go, it’s time to see which one sheds speed the quickest. Here are the braking figures. All four SUVs are fitted with disc brakes on all four wheels. But the best braking performance is offered by the Endeavour. It’s closely followed by the Alturas G4 with the Toyota Fortuner and Isuzu mu-X in a distant third and fourth, respectively. It’s no surprise that the smallest engine offers the best mileage in the city. In fact, it’s the only one that offers a mileage figure in two digits. Equipped with an extra cylinder, the Ford is the thirstiest of the lot and is closely matched by the Fortuner and mu-X. Out on the highway, it’s the Fortuner that returns the best mileage with a gap of around 1kmpl separating it from the Alturas G4 and the mu-X. The big Ford returns close to 12kmpl when driven with a light foot on the highway.